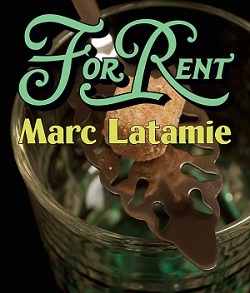 The second installment in the For Rent series featuring artist Marc Latamie (b.1952). Devoted to mid-career artists from the Caribbean and Canada, For Rent is based on the concept of transferring the use and symbolic value of Americas Society’s art gallery to the artist for the development of an in-situ installation. In his first solo exhibition in the United States, Marc Latamie reflects on the colonial trade and cultural exchange between Martinique and France. The artist explores the history of the Caribbean through absinthe, a spirit that embodied the zeitgeist of French modern art from Henri Toulouse-Lautrec to Paul Cézanne and Pablo Picasso. For more than a century the spirit was a symbol of Parisian bohemia representing abandonment and decadence. First introduced in the late eighteenth century in Switzerland, absinthe later found great popularity in France and across Europe. It was believed to carry powerful addictive properties that effected one’s perception and behavior. France introduced Martinique to absinthe, an alcohol the island continued to produce despite France’s prohibition by 1915. As a result, Latamie grew up with absinthe regularly brewed in homes throughout Martinique, and recalls that as a child he would sniff the absinthe perfume kept in his grandmother’s cabinet. “Le Salon (de) Surprise” is dedicated to Lumina Sophie, also known as Surprise, Martinique’s forgotten national heroine who in 1870 helped lead a revolt against wealthy white plantation owners. For her role in the insurgence, Surprise was convicted of blasphemy and attempting to dominate men, dying in jail eight years later at the age of 31. The salon will present a selection of artworks by prominent French avant-garde artists such as Henri Matisse, Raoul Dufy and Man Ray who portrayed women from Martinique and Guadeloupe in their works, as well as Martinican landscapes by Andre Masson and Paul Gauguin. In the final gallery space, inspired by the French bars, cafés, and cabarets where the indulgence of absinthe was rampant, Latamie created a lounge area using nineteenth and early twentieth century French furniture. Throughout the exhibition’s duration the lounge will be open for public interaction and leisure, as well absinthe tastings by invitation only. The installation will also feature a short film by Myrtha Richards-Marie-Joseph, who is 2012 made “L'Absinthe de Monsieur Gentil” (Mr. Gentil's Absinthe), which follows a man in Martinique as he distills absinthe in his home. Marc Latamie, a New York-based artist, was born in 1952 in Martinique. He obtained his degree in Fine Art and Art History from University of Paris VIII and was Lecturer at the National Museum of Modern Art, Paris. He has exhibited his work in Europe, Africa, the United States, and the Caribbean. Latamie has participated in the biennales of São Paulo (1996), Johannesburg (1997), Havana (1997), Dakar (2000), Uppsala (2000), and Spoleto-USA (2002). Group exhibitions include Tempo at the Museum of Modern Art (2002), Island Thresholds, Contemporary Art from the Caribbean at the Peabody Essex Museum (2005), and Legacies: Contemporary Artists reflect on slavery at The New York Historical Society (2006), among many others. For Rent: Marc Latamie is made possible by the New York State Council on the Arts with the support of Governor Andrew Cuomo and the New York State Legislature, and by the generous support of Étant donnés: The French-American Fund for Contemporary Art. In-kind support is graciously provided by Newel, LLC, and Lucid Absinthe. Americas Society’s Spring 2012 Visual Arts program is supported by the Mex-Am Cultural Foundation and in part by public funds from the New York City Department of Cultural Affairs in partnership with the City Council. In-kind support is graciously provided by the Mexican Cultural Institute of New York.